Bacon, it isn’t just for breakfast anymore! The crispy, salty treat is showing up everywhere. It’s in pizzas, salads, entrées and even in non-food products, including toothpaste and air fresheners. But beware — eating bacon can also be a health buster. Just two slices of pork bacon can have about 80 calories and between 200 and 400 milligrams of sodium. So Consumer Reports taste-tested 15 bacons to see which are worth the splurge. 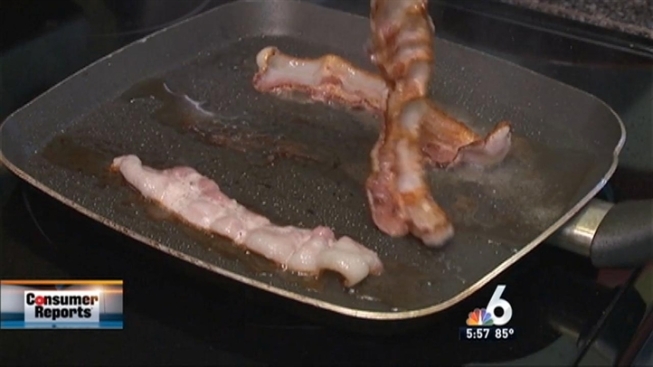 Some of the bacon tested is made of turkey, and though that is a more healthful option, Consumer Reports says that it doesn’t measure up to bacon made of pork. Consumer Reports top-rated Kirkland Signature Pork bacon from Costco. It is the only bacon tested that rates excellent for taste. It crisps up nicely and consistently has a balanced blend of fat and meat flavors, with just the right amount of smoky sweetness. Kirkland only comes in a giant four-pack, but you can freeze unopened bacon for several months. Consumer Reports says two very good alternatives are Oscar Mayer Thick Cut bacon, which has a wood-smoke flavor with some sweetness, and Great Value Lower Sodium bacon from Walmart, which is a smart choice if you are watching your sodium intake. Consumer Reports also tested pre-cooked pork bacon but found that the ones they tried tended to be tough and chewy. Consumer Reports says if you’re going to eat the good stuff, eat it less often. So instead of having pork bacon strips with breakfast, try mixing bits of it into eggs. The intense flavor means that a little goes a long way. Complete ratings and recommendations on all kinds of products, including appliances, cars and trucks, and electronic gear, are available on Consumer Reports’ website.